Far less prevalent at this time were certain other truly birdlike creatures, of which the earlier sorts also hopped and clambered and the later sorts skimmed and flew. These were at first – by all the standards of classification – Reptiles. They developed into true birds as they developed wings and as their reptilian scales became long and complicated, fronds rather than scales, and so at last, by much spreading and splitting, feathers. Feathers are the distinctive covering of birds, and they give a power of resisting heat and, cold far greater than that of any other integumentary covering except perhaps the thickest fur. 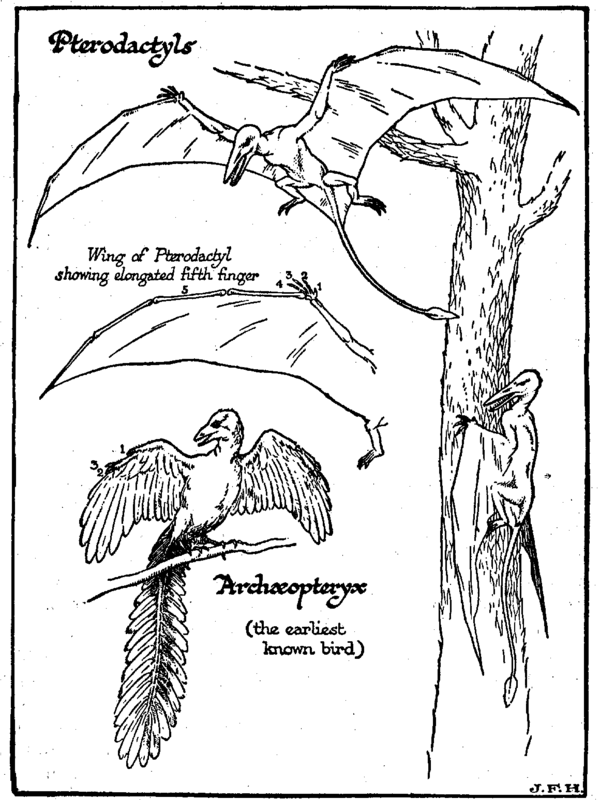 At a very early stage this novel covering of feathers, this new heat-proof contrivance that life had chanced upon, enabled many species of birds to invade a province for which the pterodactyl was ill equipped. They took to sea fishing — if indeed they did not begin with it — and spread to the north and south polewards beyond the temperature limits set to the true reptiles. The earliest birds seem to have been carnivorous divers and water birds. To this day some of the most primitive bird forms are found among the sea birds of the Arctic and Antarctic seas, and it is among these sea birds that zoologists still find lingering traces of teeth, which have otherwise vanished completely from the beak of the bird. The earliest known bird (the Archaeopteryx) had no beak; it had a row of teeth in a jaw like a reptile’s. It had three claws at the forward corner of its wing. Its tail, too, was peculiar. All modern birds have their tail feathers set in a short compact bony rump; the Archaeopteryx had a long bony tail with a row of feathers along each side.